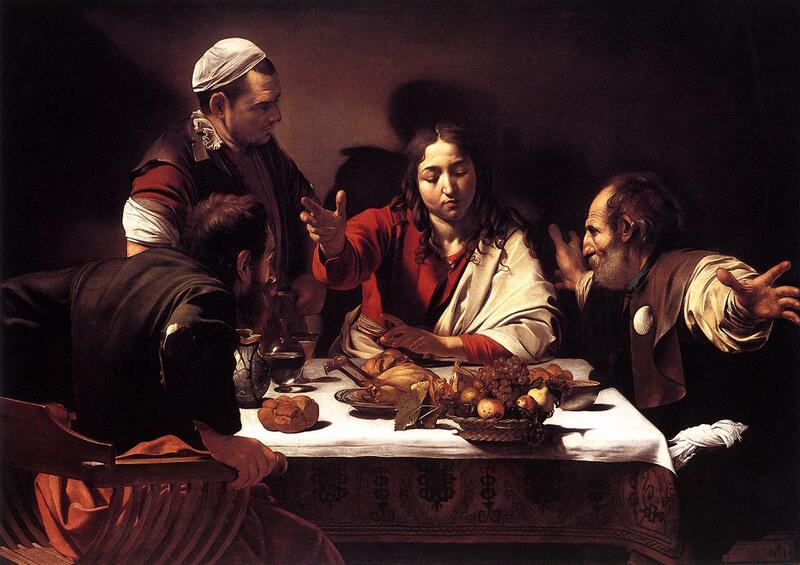 Caravaggio - "Supper at Emmaus"
Luke’s story of the two disciples on the road to Emmaus begins and ends with journey. After experiencing excruciating disappointment and loss, the two leave the bereaved and frightened community in Jerusalem and set out to Emmaus. They seem to be thinking that their time with Jesus was great, but like some much in life, it was just a fleeting moment of inspiration and hope in a life full of hardship and disillusion. Heads down, hearts broken, they leave the community behind. Contrast this with what happens after their encounters with Jesus first on the road and then in the breaking of the bread. Armed with the conviction that Jesus is somehow raised and alive in their hearts, they get back on the road, returning to the frightened, saddened, and perplexed community. They don’t know what they are going to face in the next few days. They don’t know what kind of lives they will be asked to live, but they seem to know that they must not go it alone. What does this have to do with Bruce Springsteen’s newest album “Wrecking Ball”? In some ways, both journeys depicted in Luke’s story are main themes present in Bruce’s long list of works. If we listen to Springsteen’s catalogue chronologically we witness his subtle growth from the disappointed, disillusioned guy who leaves home behind in hopes of finding redemption somewhere else to the man who realizes just how entangled and committed he is to his community. 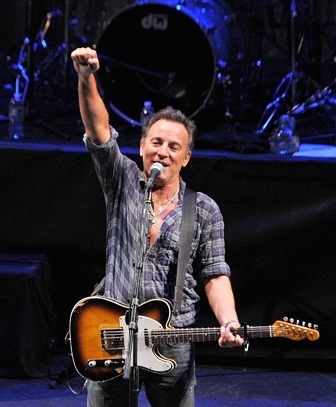 “Wrecking Ball” is the culmination of Bruce’s long and winding journey of faith in community. “Wrecking Ball” covers many of Springsteen’s most common themes: justice, pain, love, heartache, hope, doubt. But instead of simply recycling old stories, he creates new insights using his most beloved and familiar narratives. For example, contrast his 1984 song “My Hometown,” the final track on “Born in the USA” with “Death to My Hometown” on “Wrecking Ball”. The first reflects one solitary man fatalistically lamenting the slow demise of the only place and life he knows. In “Death to My Hometown”, we hear a chorus of riled voices angrily admonishing the “robber barons” who stealthily took advantage of the average working class. The main difference? Community. Sad and alone, the man in “My Hometown” feels he has no choice but to leave, while the angry crowd in “Death to My Hometown” promises to stick it out and fight together. “Wrecking Ball” is packed with Bruce’s righteous anger and sadness at the wide injustice and destruction present in our world—another favorite subject of Springsteen’s. We hear the anger in his admonishment of the government’s handling of Hurricane Katrina in “We Take Care of Our Own” and we sense his heartache and struggle in “My Depression” and “Rocky Ground.” But in the midst of the anger and the sadness, songs like “We Are Alive” and “Land of Hope and Dreams” reassure us that ultimately communal love and faith will overcome all. Like the two disciples on the road back to Jerusalem, Springsteen returns to the community proclaiming that this world is worth fighting for —even if it breaks our hearts. “Wrecking Ball” destroys the old myth that somehow if we just get in our cars and head out on our own—away from the pain and heartache —we will find happiness and peace. Bruce shares with us something that he has suspected for awhile. The lonely highways and byways cannot offer the salvation and redemption for which we yearn. Going it alone means an assured death. But if, and only if, we return to stand with and for the crucified in our midst, fighting and struggling together, hope will re-emerge and salvation will surely be ours.